Welcome everyone to my review of the Sunrise Calender App! First things first. Sunrise is a Calender app. It is available on many platforms including Android, iOS, Chrome and the Web. Sunrise has a very modern and slick interface. This review is going to be about the Android app as I have been using that for most of my experience with Sunrise. Most people already have calenders started in things like Outlook, Outlook.com, Gmail, or iCal. So which of these calenders works with Sunrise? Several calenders work with Sunrise and surprising some apps that aren't calenders also work. In the screenshot above are only a few of the apps that work with Sunrise. 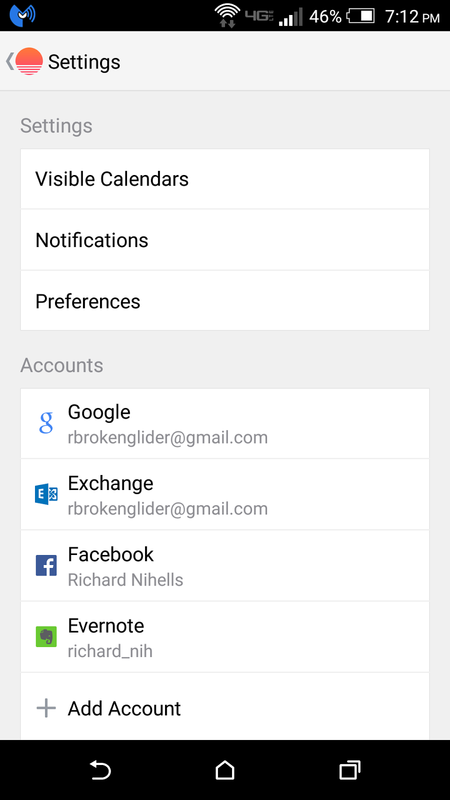 Of coarse Google calenders and Exchange calenders, aka Outlook and Outlook.com, work with Sunrise but you can also see Facebook and Evernote in that list. 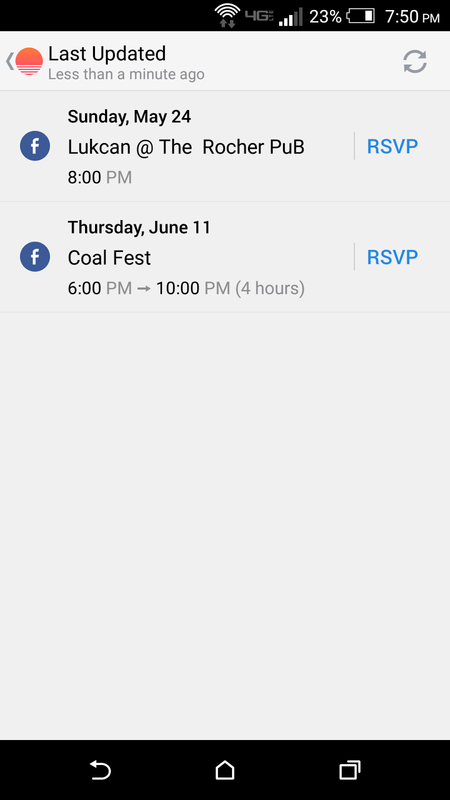 Facebook will bring in events that you were invited to and that you accepted and Evernote will bring in reminders that you have set on your notes. This is amazing! Now I only have one app to check for all those things. Besides that Sunrise can also bring in holiday, weather, and sports calenders. This is a huge amount of integration! More then any other calender app I have ever used. So how does Sunrise show you all these events from these different sources? 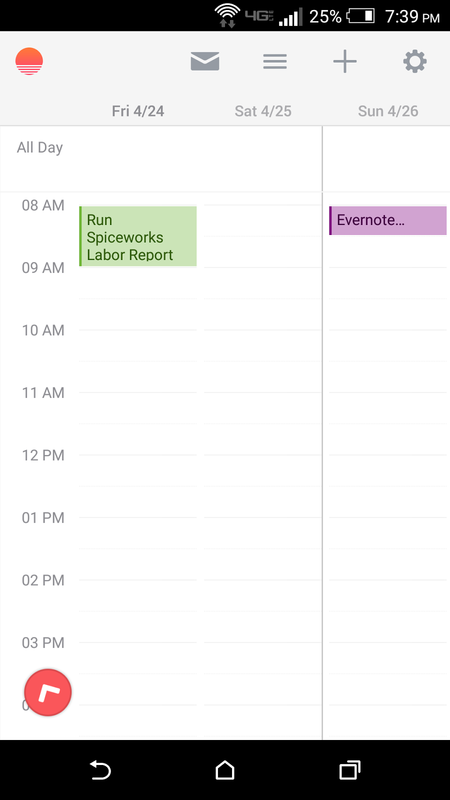 Well Sunrise lets you view your calenders in two different ways. The picture on the left shows you which day you are on and which day is today. Below that it shows you what is coming up in the next few days and what calenders and apps they are from. The different colors represent the calender that the event is being pulled from. The little arrow in the red circle at the bottom left takes you to today no matter how far you have scrolled away. To switch to the other view you tap the icons with three lines in the menu bar at the top. The second view is a little more traditional. This view shows you what's coming up over the next few days hour by hour. Larger screen sizes will show you more days. Scrolling down takes you further into those days by the hour. Scrolling left and rights moves you between days. The arrow at the bottom here takes you to the current hour of the current day. My personal favorite view is the day by day one. I almost never use the hour by hour view. Now how about adding things into your calenders? How good is that? Well pretty easy actually. This picture shows you what is looks like when you add an entry into a calender. You can see towards the bottom that you can pick what calender you are adding the event into. Much better then just adding it to your default calender. 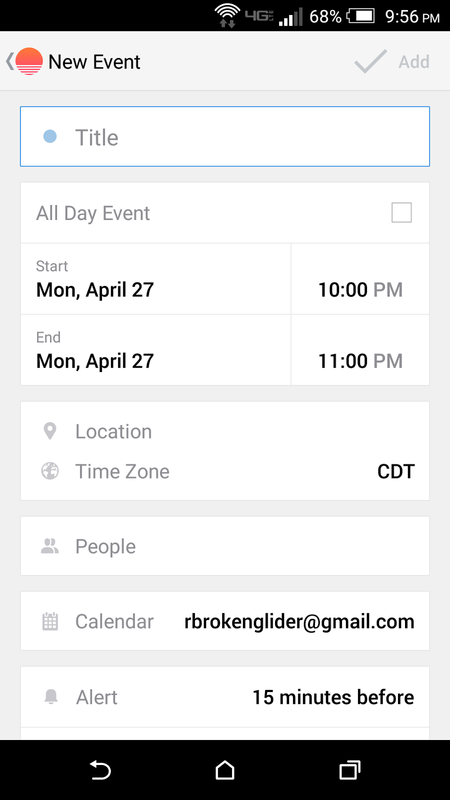 Other then that it is like most other calender apps when you add an event. The interface is nice, clean, and sleek. 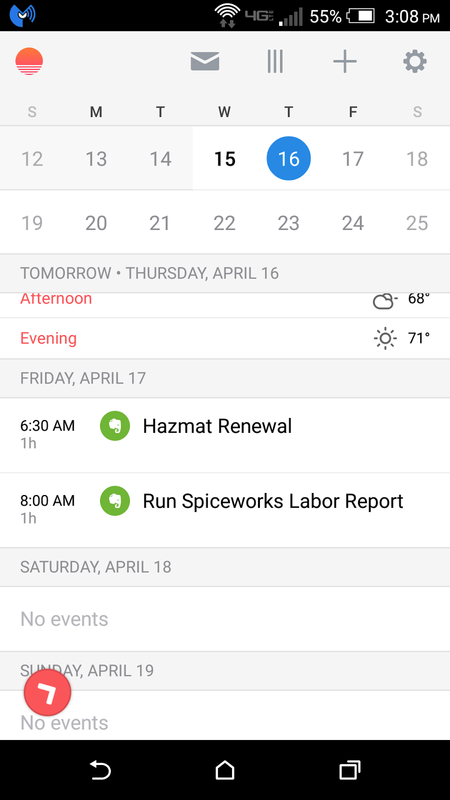 Now Sunrise has an extra feature for adding events to your calender that I really like. At the main calender view you will see a mail button at the top of the screen. This brings up events that you are invited to but have yet to accept. This picture shows that I have two Facebook event invites that I have yet to accept. This area now brings all my event invites into one area for me to see. This is going to make accepting events and adding them my calender so much easier then going to each of the calenders individually. And that finishes up my first software review since my return to this blog. I hope you found this useful and if you didn't then I congratulate you on reading this far down the page and not quitting on this post sooner. From now on Sunrise is going to be my default calender app. My search is over for this particular kind of app. For now... If you enjoyed this or found this useful then I ask you leave a comment down below. Also help us to spread the word of the Tekk In Motion blog by follow the link to our Facebook page on the right and giving us a like. The more likes we get the more people will discover us and how awesome this blog is!